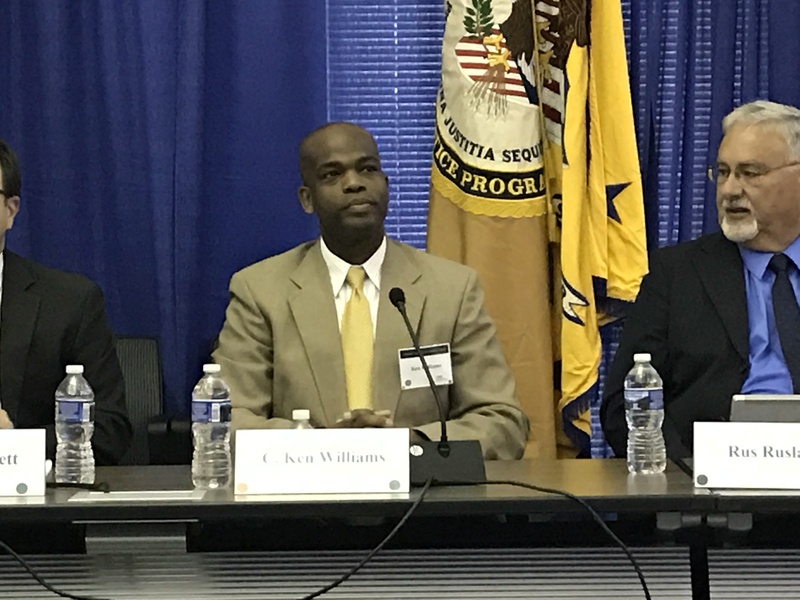 The Department of Justice extended an invitation to the AAFS to attend the 13th Meeting of the National Commission on Forensic Science (NCFS) in Washington, DC, on April 10-11. As the Criminalistics Section Board of Directors Representative, I was given the privilege of representing President Betty Layne DesPortes as the AAFS representative. The two-day meeting provided an opportunity for the NCFS Commissioners to: discuss the work products generated as a result of the previous meetings; discuss the path forward for the NCFS; hear the personal experiences with the criminal justice system from the different perspectives of a defendant and a victim; and receive feedback from various members of the forensic science community regarding the work of the NCFS. Since its beginning in 2013, the NCFS has had a total of 49 Commissioners (14 of whom are members of the AAFS) and seven sub-committees. The Commission has been active across its two terms, adopting a total of 44 work products: 20 Recommendation documents, which proposed specific requests and described recommended actions within the Federal system; 23 Views documents representing the collective views of the Commissioners; and 1 Summary document that was passed on day one of the meeting. The NCFS Meetings have involved 143 invited speakers, including those in attendance for the 13th Meeting. During the opening remarks, Associate Deputy Attorney General Andrew Goldsmith informed the Commission that the NCFS Charter will not be renewed. He announced that Attorney General Jeff Sessions intends to create a Forensic Science Task Force to review the efforts of the Commission and plans to appoint a Senior Forensic Advisor to address many of the key issues identified by the Commission. According to Mr. Goldsmith, the Advisor will address topics such as the biggest needs of the forensic community; how to improve practice; and the sufficiency of the Organization of Scientific Area Committees (OSAC) structure. Kent Rochford, the Acting National Institute of Standards and Technology (NIST) Director, followed Mr. Goldsmith and assured those in attendance of the commitment of NIST to improve the OSACs. The goal is to create a sustainable operational model for the OSACs with both a defined structure and authority. This should come as a relief to those involved with, and the many benefiting from, the OSACs and I am glad to share this news with the entire membership. Day one included a Wrongful Convictions Panel featuring Keith Harward, who received a life conviction for a sexual assault committed in 1982. The key evidence in the case was a bitemark on the victim’s leg. Years later, Mr. Harward petitioned the Innocence Project to review his case. After spending 34 years in prison, he was released in 2016 when the results of the DNA analysis linked the evidence to another individual through the use of the Combined DNA Index System (CODIS). Gerald LaPorte of the National Institute of Justice’s (NIJ’s) Office of Investigative Forensic Sciences reported that the NIJ has awarded 55 post-conviction awards worth more than $40,682, with 100 being awarded from when the program began in 2008 to 2016. Post-conviction DNA testing assistance has resulted in 39 exonerations in 12 states. The day also included a Forensic Science and Victims Panel. Natasha Alexenko, founder of Natasha’s Justice Project, spoke of her 1993 incident in which she was raped, robbed, and sodomized as a college student. She told the audience how she wanted to shower following the incident, but she was urged not to do so by a friend in order to preserve the forensic evidence. A sexual evidence collection kit was collected; however, the case went cold. Years later, the kit was tested and she received notification of a CODIS hit in 2008. Day two of the meeting included a Training and Continuing Education Panel and panels which allowed a variety of professional organizations to provide their feedback regarding the NCFS. During the Education Panel, AAFS Past President Carol Henderson discussed the Recommendation on Forensic Science Curriculum Development adopted by the NCFS in 2015 in addition to the on-demand webinars available for litigators. 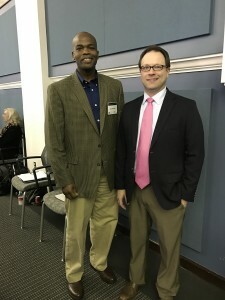 Kevin Lothridge, CEO of the National Forensic Science Technology Center, also discussed the web-based delivery of instructional material and informed the audience of resources available to the general public, such as www.forensicsciencesimplified.com and Fauxrensics. The two Professional Organization Panels provided feedback from the perspectives of the legal community and the forensic science practitioner, which I participated in as the AAFS representative. 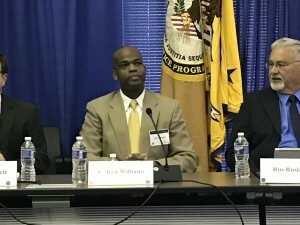 The other organizations represented included the National District Attorneys Association, the National Association of Criminal Defense Lawyers, the American Bar Association, the American Society of Crime Lab Directors, the International Association for Identification, the International Association of Coroners and Medical Examiners, the National Association of Medical Examiners, and the National Sheriff’s Association. I am fortunate to have had the opportunity to represent the AAFS on behalf of President Betty Layne DesPortes at the 13th Meeting of the NCFS. As the representative, I informed the NCFS of our support as an organization, but expressed concern regarding the limited number of commissioners from the state and local levels. Although the AAFS would have preferred the charter be renewed, we are hopeful of the continuation of the progress made by the NCFS.